You don’t have to be old for your memory to fail. I can’t begin to tell you how many times I’ve misplaced my car keys. Or I’ve found myself backtracking in order to figure out, “What did I come into this room for?” And what about people? Do you ever forget who someone is? They look familiar, but you can’t quite place where you’ve seen them before or how you know them. We laugh it off and make up excuses as to why we can’t remember. Sound familiar? This season of life with my dad has been an interesting one to say the least. Nine years ago, he was the one taking care of Mom. Today, unable to care for himself, I care for him. So many turn of events have transpired throughout these nine years. Dad’s life is altered daily by the disease of vascular dementia. At first, there were subtle changes that anyone at any age might experience, such as misplacing his keys, toys, clothing items, the mail, and so on. As time went forward, an awareness set in that there was a significant progression in memory loss. Thanksgiving of last year at my brother’s home was our first experience of Dad not recognizing where he was or who the people were surrounding him at the dinner table. Trying to put the puzzle pieces together, a look of confusion appeared on Dad’s face, because at the present time the pieces didn’t fit. I catch my Dad staring at photos. The confusion doesn’t seem to be there when he looks at “older”photos, but only when the subject matter is more current. Recently, my dad’s memory and physical state have significantly declined. Grandkids have been coming to see him, and one of his granddaughters and a great-grandson came over after he had been in bed for a week and was not doing well. Surprisingly, he seemed to know them. Such a small thing became a significant blessing. This Saturday my son Chris came to visit. He lives out of state and more than likely this will be the last time he gets to spend any one-to-one time with his grandpa. 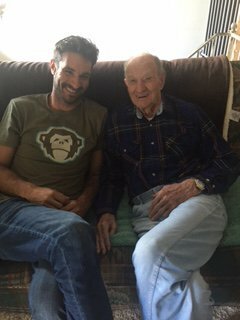 His grandpa was 99% better than the week before, but I’m not sure he knew Chris. He would ask my son how work was, or if he was working hard, and then ask the same questions again a little later. Chris had to go back home that evening. I asked to get a picture of the two of them together. He sat down next to his grandpa and put his arm around him. His grandpa looked up at him with a confused expression like, “Who are you?” I wasn’t quick enough to capture that look, but the image that I did capture appeared to be the same grandpa and grandson that had always been before.